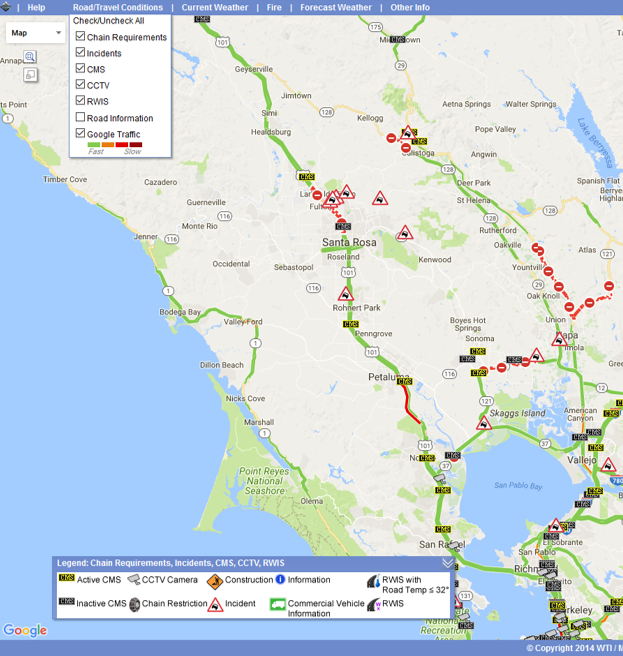 Incidents, CMS Messages, and Closures related to fires north of San Francisco on Monday, October 9, 2017. 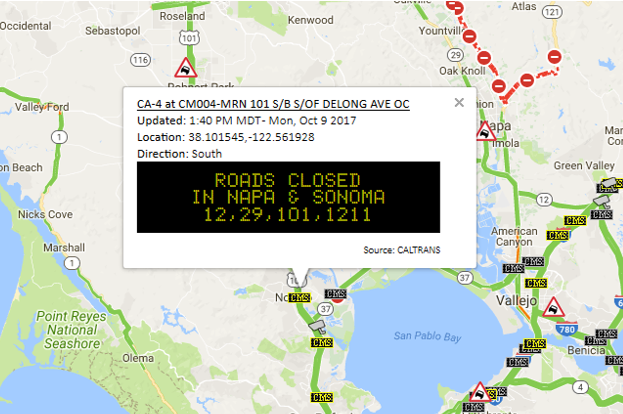 Road Closures indicated on a CMS north of San Francisco along US 101 on Monday, October 9, 2017. 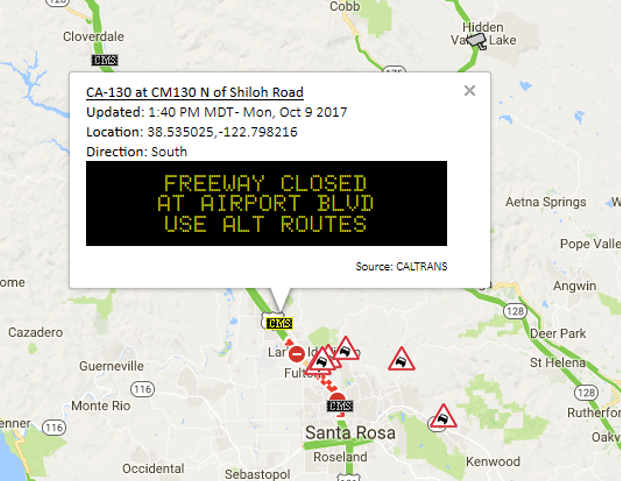 Closure of US 101 shown on a CMS north of Santa Rosa on Monday, October 9, 2017. 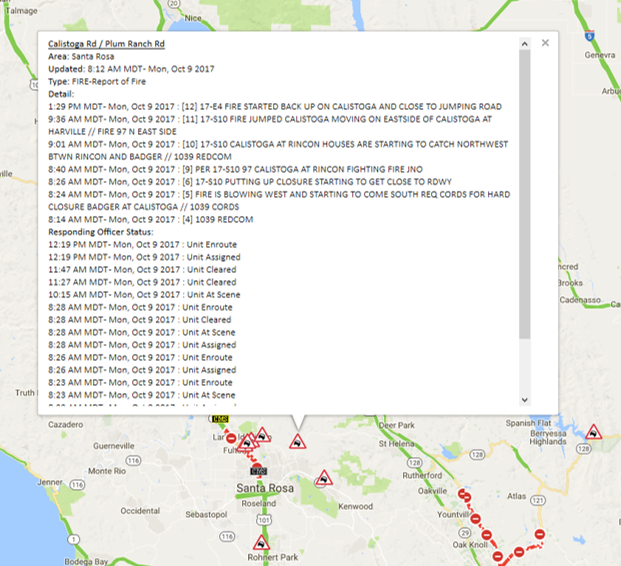 Closure of California State Route 121 shown on a CMS on Monday, October 9, 2017. 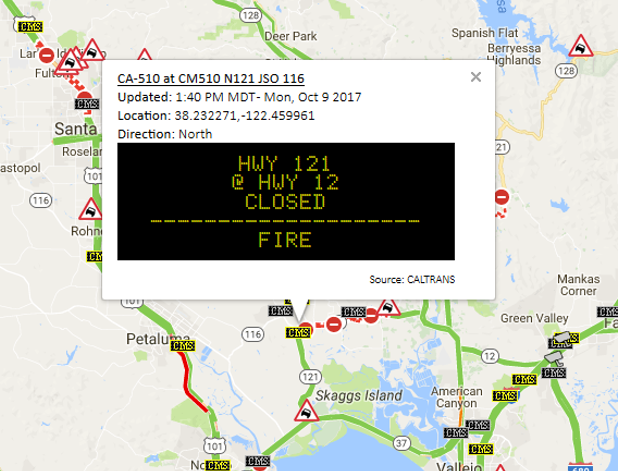 Detailed CHP Report of fire near Santa Rosa on Monday, October 9, 2017. 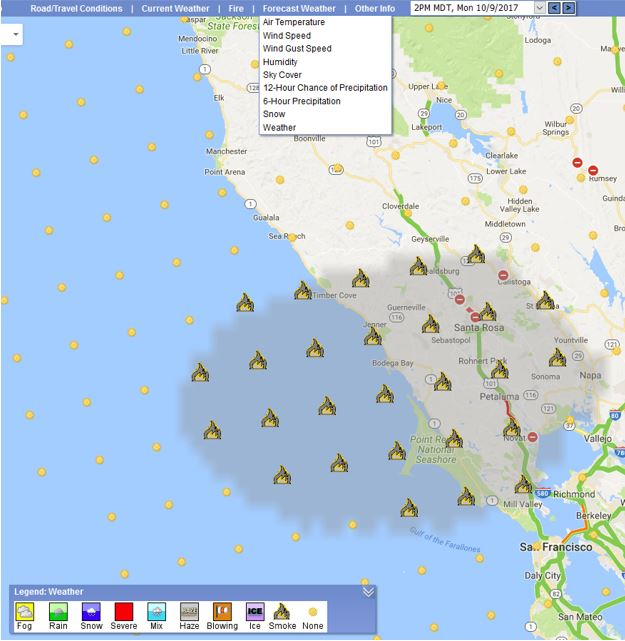 Smoke was forecast to cover a large area north of San Francisco on the afternoon of Monday, October 9, 2017. 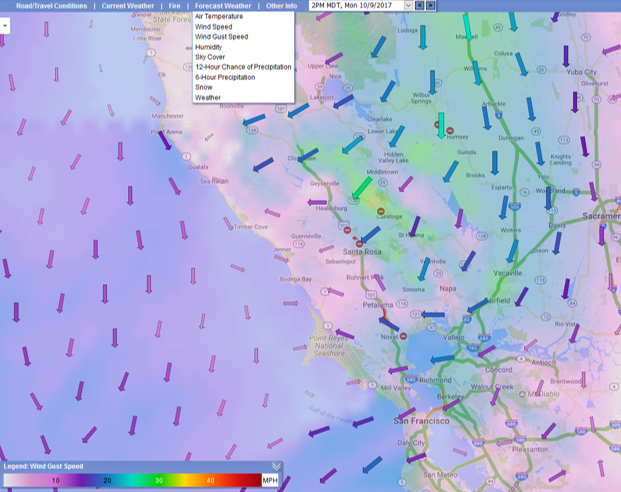 Wind Gusts were forecast approaching 30 mph near Santa Rosa on Monday afternoon, October 9, 2017. Forecast for Low Humidity on the afternoon of Monday, October 9, 2017. Even as we write this update on Tuesday morning, October 10, 2017, the fires are still burning hot, and smoke is forecast to impact an even larger area, extending north past Redding. 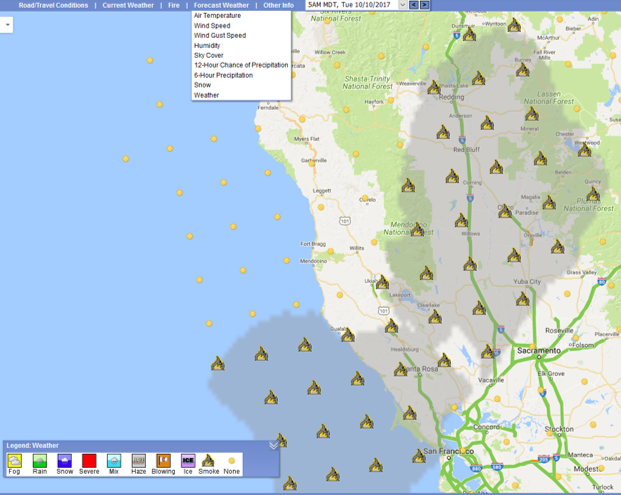 Fires near Grass Valley northeast of Sacramento are likely contributing to the haze. Forecast Smoke on the Morning of Tuesday, October 10, 2017. 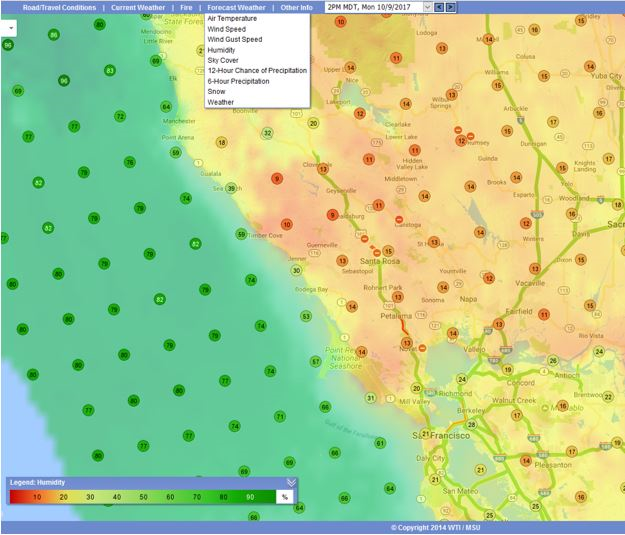 Be sure to gather as much information as possible from OSS (http://oss.weathershare.org/), Mobile OSS (http://oss.weathershare.org/m) and all available sources before and during trips to plan for safe travel. Check back soon for more OSS updates.